We had a big surprise when walking into the Berean office on Wednesday. 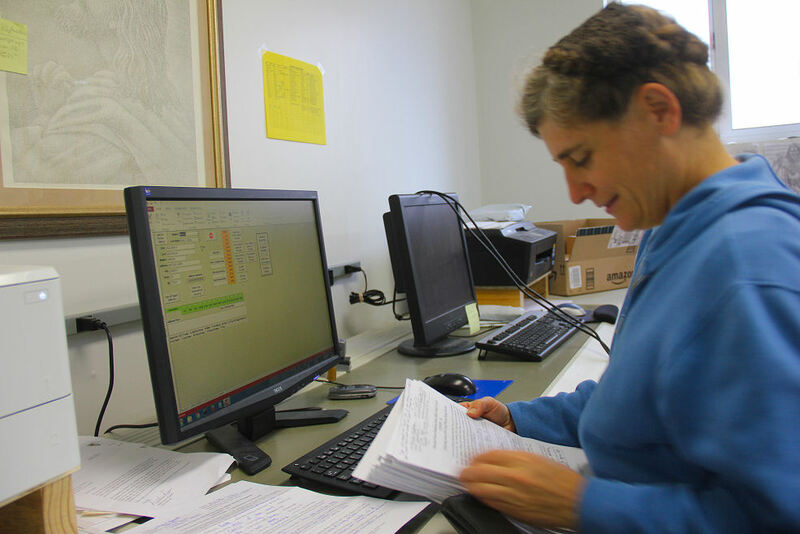 The table was covered with boxes of envelopes that had already had the return address stamped on. The Peoria Bible class picked up 10,000 envelopes on Sunday along with the new return stamps we had just purchased and took them to Peoria's Midwest Food bank and finished them! That is one job I really don't like to do and yet it must be done. The other surprise was the many boxes of wrapped Bibles. Princeville had Harvest Call on Friday, Martha Kay and Dana picked up Bibles and the supplies for stuffing and wrapping and wrapped hundreds of Bibles then brought them all back. Our Thursday group tomorrow is going to be thrilled. 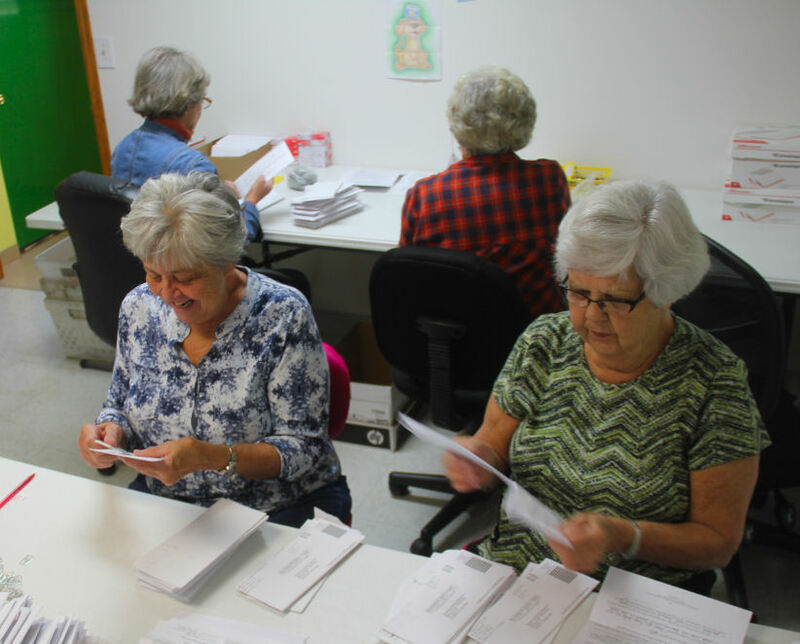 As no work was done on Tuesday at the Berean office we weren't sure how much mail would come in and how many of our usual Tuesday workers would be able to come on Wednesday. Well all of us that did arrive were pleasantly surprised at how well Wednesday worked. Eva Jean got tired of opening the mail and started doing one of her favorite jobs, applying labels. 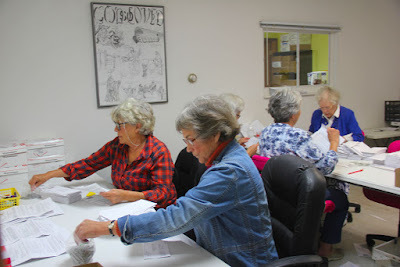 Joyce and Jan were put right to work opening mail while Marie entered. Marvin was our only reader. Chuck was put to work applying labels. Shirley and Glenna spent most of the morning opening mail. 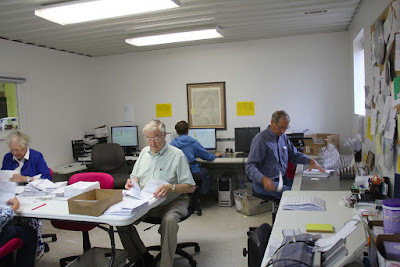 We broke for lunch then went right back to work finishing up the labels then stuffing envelopes. None of the Bible requests were entered but we were able to finish the studies. We have a full box of studies to be graded and this entire box is going to the Roanoke church. Rebekah told us that church is out of studies and hungry for more. We are so very thankful for the many willing graders.